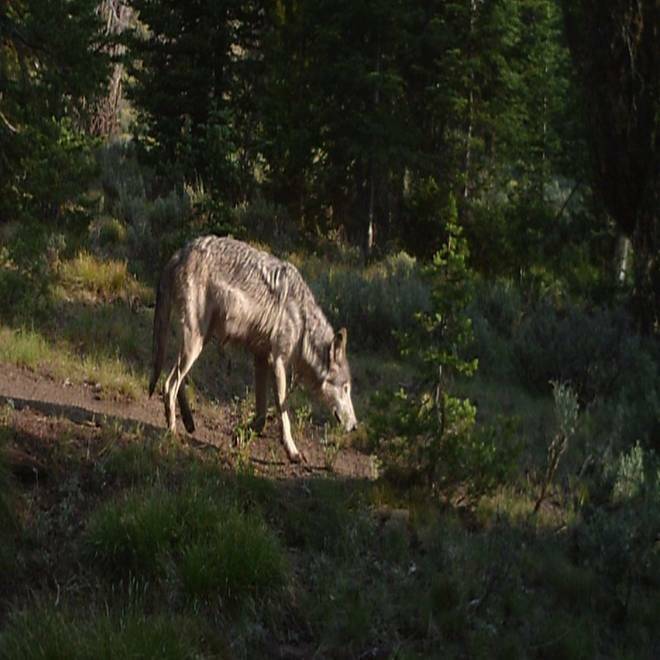 This gray wolf is part of a pack near Ketchum, Idaho, that might have been the intended targets of poison-laced meat. 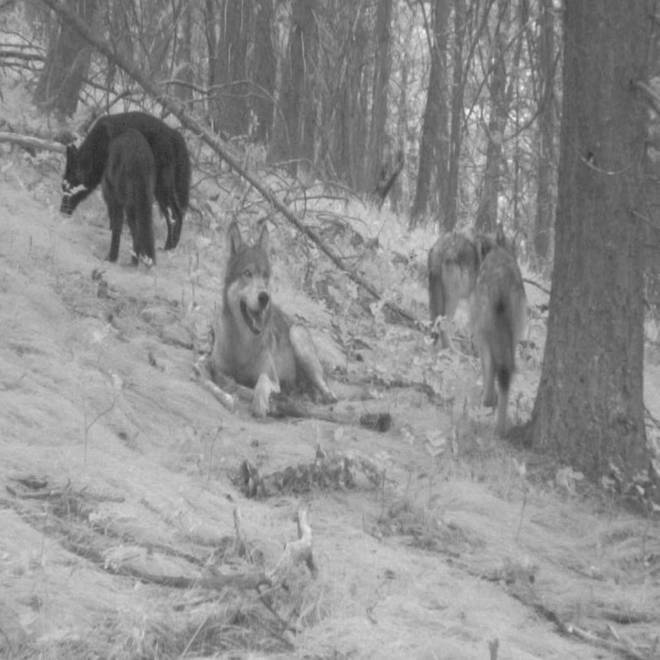 Fearing that someone is trying to kill gray wolves in central Idaho, an environmental group and a sheep ranch this week put up a $1,000 reward for information leading to the arrest of whoever laced meat with poison that instead killed one dog and sickened another. That the poisoning happened wasn't so much a surprise. The resurgence of gray wolves across the Pacific Northwest is controversial, including this area of central Idaho known as the "sheep superhighway." But Defenders of Wildlife and the Flat Top Ranch hope their reward will galvanize locals and showcase the value of using non-lethal tools to try to minimize wolf conflicts. "It would be a real shame for incidents like this to undermine all our hard work," Suzanne Stone, the Defender of Wildlife's Northern Rockies representative, said in a statement announcing the reward. "We hope the community will use this as a rallying cry to continue promoting greater tolerance for all native wildlife." John Peavey, owner of Flat Top Ranch, acknowledged that the resurgence of wolves has meant "many challenges," but he added that "we must meet them within the framework of our laws. Those responsible need to be brought to justice." The poisonings happened in mid-August, when two dogs fell sick after eating chunks of meat while on separate hikes with their owners outside Ketchum, a town that also is home to the world-famous Sun Valley Lodge and ski resort. One dog died a few days later, while the other recovered. The meat was poisoned with Xylitol, an artificial sweetener used in human food but which can be lethal to animals by causing a surge in insulin and becoming toxic to its liver. Xylitol first surfaced in connection with wolves in 2010 when anti-wolf activist Toby Bridges blogged that many hunters were packing "a healthy dose of the sweetener whenever they head out for big game." He also warned hunters to make sure their dogs didn't get near poisoned carcasses. Washington state completes a sharpshooter cull of a wolf pack that had been feeding on livestock. KING's Gary Chittim reports. Stone told NBC News she didn't know of any confirmed cases of wolves being poisoned with Xylitol, but added that federal and state officials with whom she met suspected the batch eaten by the dogs was meant for wolves. Gray wolves used to be abundant across the Northwest, but settlers a century ago nearly wiped them out. In the 1990s, the U.S. Fish and Wildlife Service began an effort to return them to the northern Rockies, bringing 66 wolves into Yellowstone National Park and central Idaho from Canada. The wolves eventually went beyond the park's borders and into other parts of Wyoming and neighboring states. About 1,400 are in Idaho, Montana and Wyoming, where wolves were taken off the federal endangered list due to their rising numbers. The poisoning incident comes after several years of progress with local sheep ranchers in minimizing wolf attacks, she added. A hidden camera used to track wolves captures the alpha female of a pack near Ketchum, Idaho, in mid-August along with her pups. Keeping humans with bands of sheep at night. 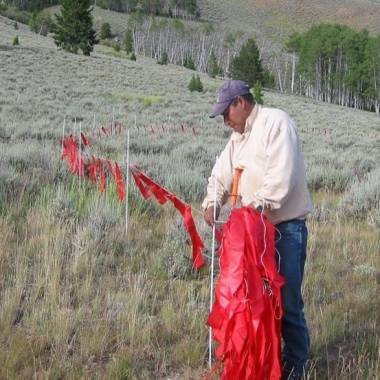 A herder with Lava Lake Lamb sets up a fence made with flags to deter gray wolves as part of the Wood River Wolf Project in Idaho. "Our field crew has spent more than 70 nights camping with the sheep bands this summer," Stone said. "The deterrents are working very well despite the almost constant presence of wolves near sheep." Out of more than 10,000 sheep in the area, she added, just four were lost this summer. Those four sheep belonged to a project partner who initially wanted the wolves killed but then backed off when it was realized the pack was a new one that hadn't been tracked, Stone said. "As a result of his support," she said, "no wolves were killed and our nonlethal deterrents kept wolves from killing more sheep since that event in early July." This week and next, field crews will sleep with a band of sheep as it makes its way down the "sheep superhighway" and then through Ketchum on Oct. 13 for the annual Trailing of the Sheep Festival, Stone said. "We have wolves right where the sheep are now," she told the Idaho Mountain Express. "We’ve had our field crew intercept wolves coming in to howl and bark at the dogs. So far, the deterrents have been holding." Defenders of Wildlife explains its Wood River Wolf Project.